The experience of age 60-plus workers is becoming increasingly important, because there are more of them in this country than there ever have been – a rising trend that will continue. The obvious reason for their growing numbers is the baby boom bulge. The oldest boomers turn 67 this year. But more people are also delaying their retirement, whether due to financial necessity, good health, or a love of work. More Education. In 1985, just 11 percent of older Americans had graduated from college, compared with 23 percent of younger adults. Today, roughly one-third of people in each age group have degrees. Earnings Growth. Older men have seen enormous increases in their pay: in 1985, they earned just 70 cents for every $1.00 of average annual income – wages plus self-employment income – earned by adult men in their prime. By 2010, that had jumped to 92 cents. Older women’s annual incomes are also increasing faster than the incomes of women in their prime, according to the study published by the Center for Retirement Research, which also supports this blog. But older women still haven’t caught up with prime-age workers to the extent that older men have. Productivity Gains. It is no longer true that older workers are less productive than employees in their peak working years. Burtless found that older men’s hourly wages – his unit of measurement for comparing productivity – have caught up with hourly wages for workers in their prime. Older women have somewhat closed the gap with younger women. 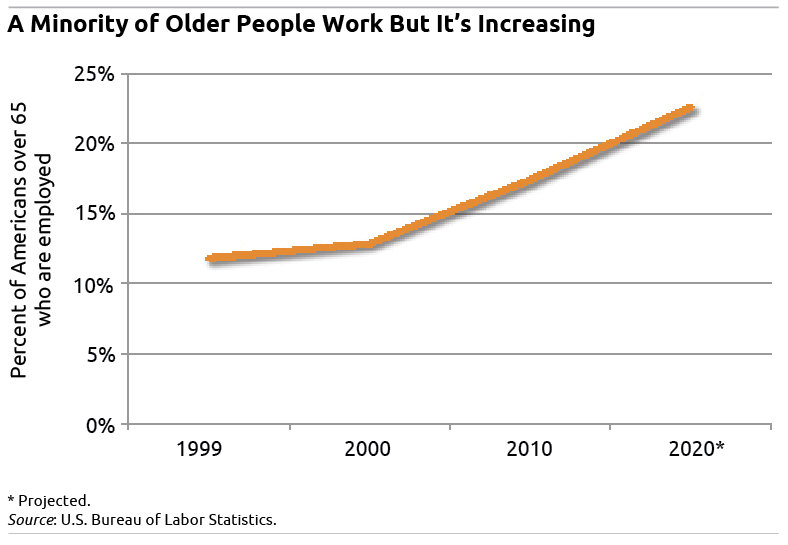 The workforce of older Americans is not only getting bigger. What Burtless shows is that their status in the labor force is also getting better.